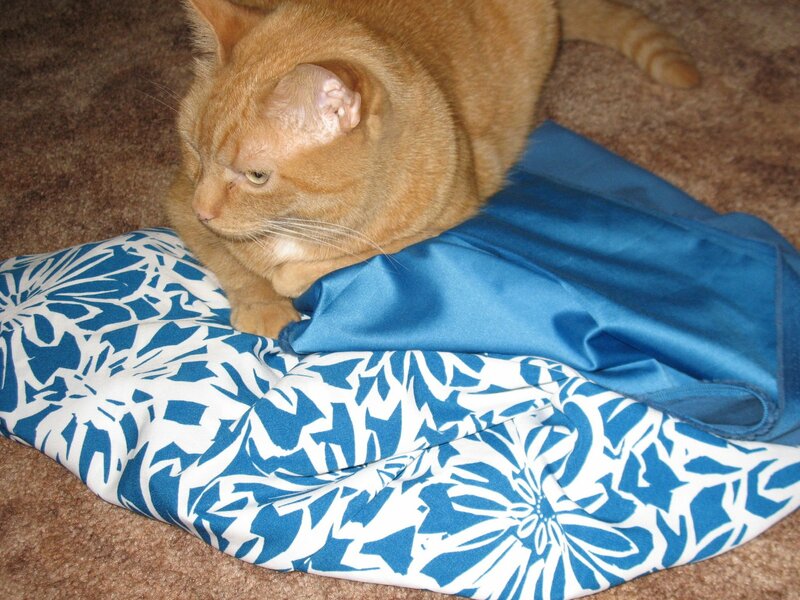 I’ve been doing some browsing through new blogs this week, thanks to Mom2fur‘s alphabet blog list and a little time to continue digging through the Big List of Sewing Blogs, so not everything I have on here is actually from this past week. But it was still on the front page. I’ll start with my Crafting a Green World picks of the week. 1. If you’ve been following this blog for any length of time, you’ll know that clothing reconstruction is not a new thing for me– though it’s been at an increasing rate in the last few years, really, I started reconstructing back in high school when I turned a pair of my brother’s unwanted pants into a messenger bag. But I did really enjoy this article, both for the reminder of the positive environmental impact of reconstruction, and for the inspiring clothing pictures. 2. I also liked their recycled paper bag seed packet buisness cards tutorial. Not that it would work for me in the music biz, but it could make a cute party favor or something. 3. I also have two picks from Fairy Threads this week. These flower pillows were just too cute to pass up, and I liked these insulated can wraps— great scrap-user, plus it used batting instead of foam, so it has the potential to be much more eco-friendly. 4. In A Minute Ago posted a link for this nifty online “color schemer“. I played around with it a bit, and it looks like a fun way to play around with color schemes for scrapbook layouts. The last three are from Mom2fur’s picks. 5. This doesn’t really have anything to do with crafts, but the pictures make me laugh. Especially Iron Man. 6. This is really from last week, but I didn’t find it till this week so I’m counting it. This little folding tray from Marmadaisy is another great scrap-user (fat quarter size), and I like the origami look of it. Ok, seven seems like a good number. And now I’m off for Baltimore and bachelorette partying, so enjoy your weekend! Seriously… I haven’t done a thing this week, other than a few stitches on J’s wedding gift. I was gone on the backpacking trip till Monday night, yesterday I got done work/dinner too late, today’s been taken up with finishing getting my summer clothes out from under the bed and taking care of the toe I busted after I got back from the trip, tomorrow’s going to be another later teaching night… I did, however, get my fabric from Gorgeous Fabrics in the mail today. No pictures yet, but I love it and can’t wait to work with it. Which probably won’t happen until after the wedding, since I have a couple other things that are taking higher priority. I am, however, going to have a good bit of crafty time this weekend, since C and I are going down to T’s place in Baltimore for another crafty hangout weekend thing. My plan is to finish J’s gift since all I have left is handwork, cut out my purse for the wedding (which I am going to be making entirely out of scraps from other projects and a zipper that I have, which means that other than the pattern that I bought, this bag is FREE! ), and if I still have time, cut out a new wallet for myself. 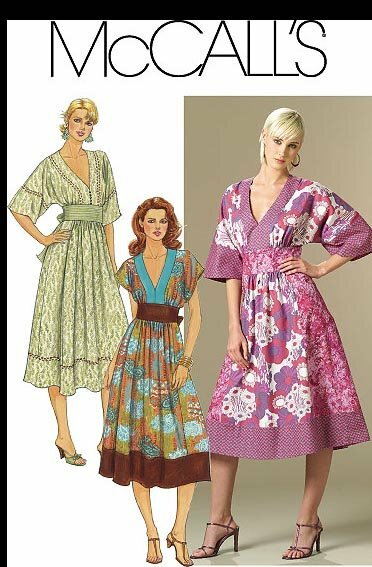 My mom had a pattern that’s pretty much exactly what I need, and I’m going to chop up an old skirt for the fabric. Not sure I’ll have time to get to that one since the purse will be a bit involved– I’m using the leftovers from a skirt I made a few years ago for the outside, but since it’s lightweight fabric, I’m going to underline it with the cotton batiste left over from the Spring Fever blouse and will need to spend some time basting those pieces together (which I’ll do by hand, since my plan also involves propping up my foot and sitting in a comfy chair and not hauling my machine up three flights of steps to T’s condo! I have to get myself over the limping by the wedding!) I’m also going to be lining it with the leftovers from the Azalea tunic— it matches and it’ll add a fun touch to it, even if I’m the only one who knows about it. I’m making the black purse that’s folded up like a fortune cookie, for those of you who are curious. I think. I may change my mind and go for the black and gold glittery-looking one… as long as I can fit my camera in the bag, that’s the main thing. Any opinions? First off, this isn’t really a blog thing, but I just have to say something about Gorgeous Fabrics. I’d heard of it before from seeing things made from their fabric on a few of the blogs that I follow, and when I couldn’t find anything good at Joanns’ in the way of knits, stumbled across it again while running searches on the internet. So I found this knit jersey on there (no link because it’s already off the site!) that I thought would be perfect for this pattern that I got recently. When I looked before work yesterday, there were 19 yards left. I placed the order last night. I’m glad I got it when I did, because the owner called while I was at work today and said that she only had 2 1/2 yards left– I’d ordered 3– and did I still want it or did I want to substitute something else? I called her back, and let me say, Ann was so incredibly helpful! I told her what pattern I was using, and she told me of someone she knew who’s making it right now and was able to get it in two yards, and also gave me a suggestion of how to lay it out so that I could maximize fabric usage. (She also gave me the 2.5 for the price of 2 yards!) I think I’m definitely going to be shopping there again. 2. From Threadbanger: Not that I have a lot of places to put bulletin boards, but someday I will have my own place and then I will. And these were some neat ideas for boards made mostly from recycled materials. And apparently there is a building material made from recycled paper called homasote. I did not know this. But that’s pretty cool. 3. Craft Tutorials posted a how-to for candle globes. I’ll give you a clue– it involves balloons. And as any kid who ever tried to make a paper-mache pinata knows, crafts involving laying stuff on balloons is just a recipe for messy fun. 4. rostitchery made this cute little portfolio that she calls a “holder keeper”. Looks like there’s lots of uses for this sort of thing. And with that, I am off to finish my week’s teaching, and then packing, and then off to the great outdoors to test my hiking skirt while backpacking this weekend. Ciao! 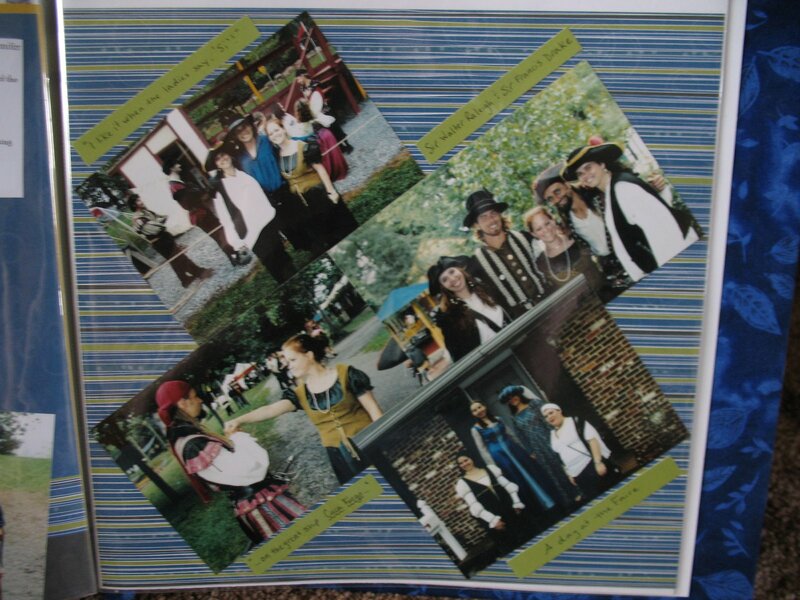 are you eating at Scarborough Fair…. It all started with the rosemary. One of the hazards of working at a garden center, as I learned today, is that on occasion you have to work with plants that smell really good. Today, I had to both ring up and label several containers of rosemary, which kept my stomach growling for the better part of the day and made me seriously contemplate buying a plant so I could take it home and eat it. I managed to resist, but fortunately I found out upon getting home that rosemary is actually one of the herbs that my mom is growing fresh in her little potted herb garden on the deck. 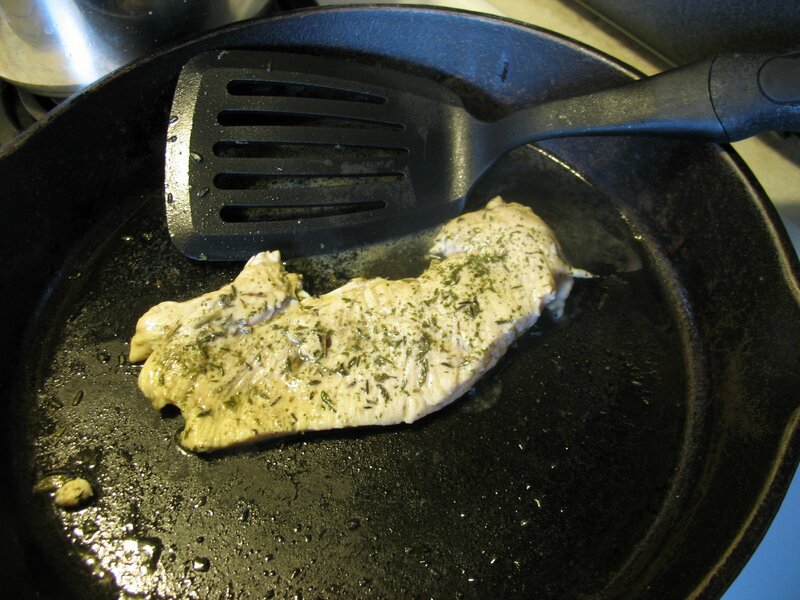 Pounding meat is the best cooking thing ever. Besides making it cook faster, it’s great stress relief! I just used an empty can that was waiting to be recycled. 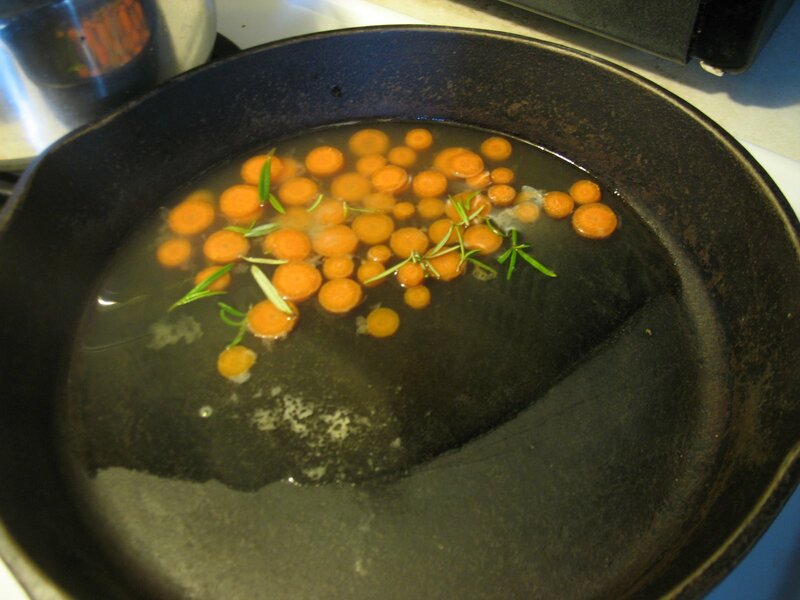 I threw the carrots and some of the fresh rosemary in with the broth and let it simmer a bit, until the carrots were starting to get soft. 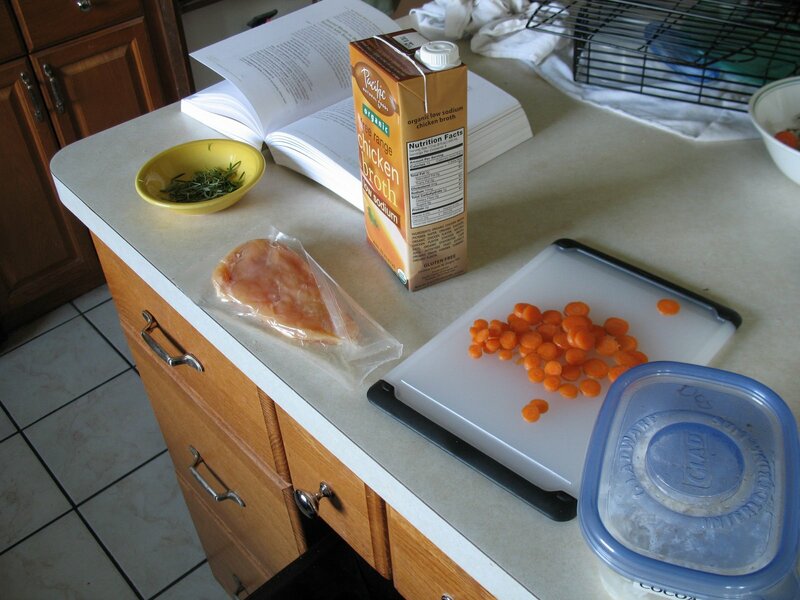 Then I took the carrots out and added some olive oil and the chicken, which I’d sprinkled on both sides with some freshly-ground sea salt, as well as some dried parsley, sage and thyme. (Get it? 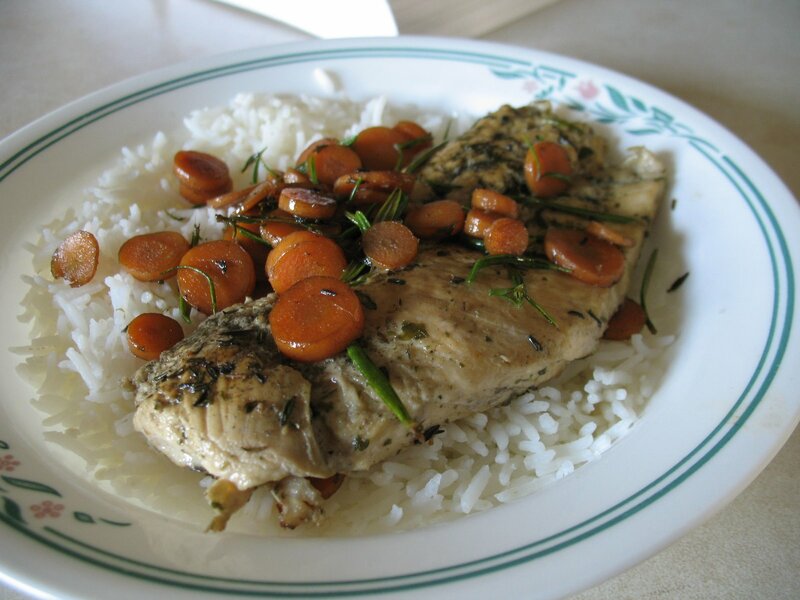 😉 Later on, after the chicken was mostly cooked, I added the carrots back in as well as the rest of the rosemary. And then I put it on the reheated rice. Since Mom2Fur asked, here’s a few of the blurbs that go with the chocolate wrapper scrapbook page from yesterday’s post. Bold text will be the original wrapper, italics will be my and C’s additions. Also thanks to Mom2Fur for the shameless plug for this blog. She’s been doing this neat series of blogs she likes, based on letters of the alphabet, and I was one of today’s picks for the letter S. Definitely worth checking out, as I’ve found some neat stuff through there. Titled thus because, the way my brain works, these three things connect. Oh, the drama! I’m going to misbehave now, and not tag, because I had so much trouble coming up with people for the last one and I know from Bloglines that this one’s been floating around for awhile. So if you want to do it, feel free to steal. The idea for this one came from my friend T, who was up here during that crafty weekend when C and I put most of it together. (She crocheted while we scrapbooked.) 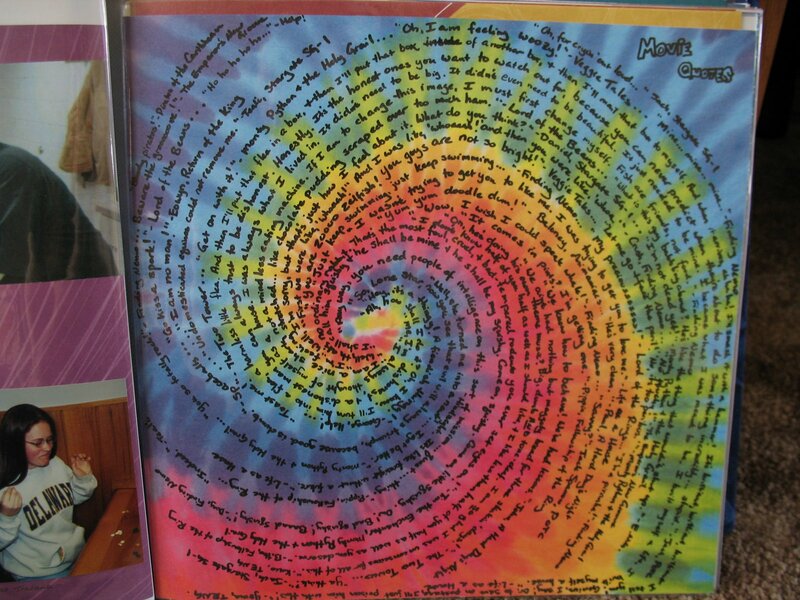 She saw the tie-dyed paper and thought it would be neat to do writing in a spiral–which I loved, because I used to do stuff like that all the time when doodling in notebooks and such. So this page is entirely one-liner movie quotes from a few of our 3-way mutual favorites, like The Emperor’s New Groove, Monty Python and the Holy Grail, The Lord of the Rings, the first Pirates of the Caribbean, etc. We’ve spent many a get-together munching on Dove chocolate and laughing at the wrapper messages. 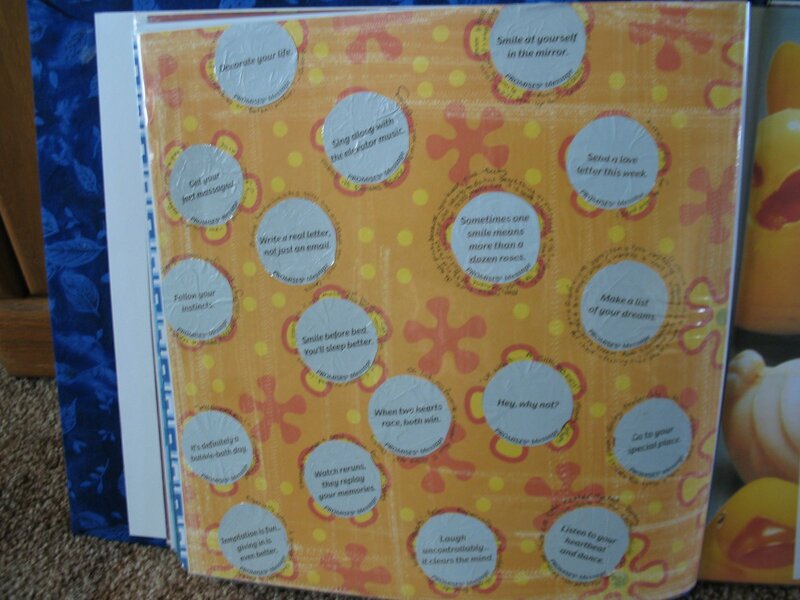 So C had the idea to include some of the wrapper messages– what we ended up doing was gluing them down, and then writing our own short additions/commentary in a circle around the wrapper pieces, ranging from serious to silly to snarky. This completely random page has a story behind it… one time, J and I decided to surprise C for her 25th birthday with a Series of Unfortunate Events-themed day (her birthday coincided with the release of one of the books), only we did a Series of Fortunate Events. So we had this letter written in the style of the back of the books, along with clues written in the style of the definitions scattered throughout. C still had them, so we were going to include a copy here. But then we forgot that I’d stuck them further down the sorted stack with this paper, thought we’d lost them, and printed out a new copy to include with pictures of that day. 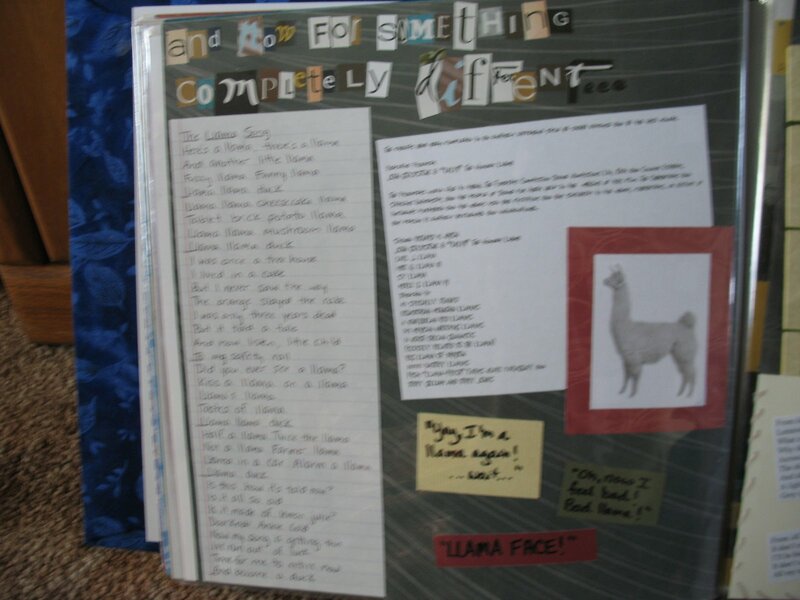 So then we had this random piece of paper that we didn’t want to take out, because it would throw off the paper pairings for the rest of the scrapbook, so we took a cue from Monty Python and did an entire page themed around llamas, with llama quotes from The Emperor’s New Groove, the lyrics to the Llama Song, a transcript of the llama credits from Monty Python and the Holy Grail, and of course, a picture of a llama. Item #3, connected to the previous item by the fact that it also has to do with J’s wedding. I had a bit of a laugh today at the expense of my bridesmaid’s dress. I took it out and tried it on to make sure I don’t need to hem it shorter or anything, and noticed a disclaimer on the tag, which was obviously meant for people who don’t sew and therefore don’t know anything about fabric. It says…. The irregularities and variations in the color and texture of this fabric are characteristic of the fabric adding to its natural beauty, and is in no way to be considered as defective. Grammatical errors aside (I would have put a comma between “fabric” and “adding”), what really killed me was the “natural beauty”. 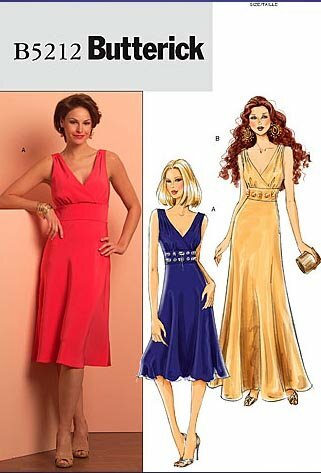 The dress is made of 100% polyester. The rules of the game get posted at the beginning. Each player answers the questions about themselves. At the end of the post, the player then tags 6 people and posts their names, then goes to their blogs and leaves them a comment, letting them know they’ve been tagged and asking them to read your blog. Let the person who tagged you know when you’ve posted your answer. a) What was I doing 10 years ago? I was finishing up my junior year of high school, and trying to figure out what I would do for a summer job (I ended up working at Dairy Queen). So that means next year is going to bring my class’s 10-year reunion…. how scary is that?! 5. If I still have time, deal with the massive pile of laundry in my room that needs to be put away! c) Snacks I enjoy: Anything chocolate, s’mores, buttermilk ranch hard pretzels, trail mix, dehydrated fruit, cheese & crackers, cheese & apples & crackers, fresh fruit when I remember to eat it! d) Things I would do if I were a billionaire: I’d have to get the practical stuff out of the way– pay off the rest of my car, and then buy myself a small house (enough space that I can have my craft room and my teaching studio, but I’m only one person, I don’t need a huge space. And I’d still furnish it from the thrift store and other DIY methods!) I’d also take a few of those trips I’ve always wanted to take– Hawaii, the European tour, and New Zealand (Australia too, if I could swing that.) I’m not really a luxury vacation person (last year’s road trip was totally done on the cheap, as was the Florida trip a few of us girls did a couple summers ago, and I think it makes for a much more memorable vacation! So I’d still do it that way–unless they have one of those geeked-out tours where they’d take me around everywhere in NZ where they filmed LotR. I would totally do that.) I’d also want to donate a chunk of it– maybe to something like the Blood:Water Mission, or “adopting” a sponsored child. But I wouldn’t quit my music career, or sewing my own clothes! I had an unexpected day off from the garden center due to the rain (when it’s raining all day, I’ve learned, I get calls sometimes telling me not to come in because it will be dead.) So, of course, I decided to do some craft-related things…I got a free shirt from a clothing exchange that my church did a couple months ago, and I really liked the shirt’s style, but it’s a large so it was a little too big for me. So I decided to play with my serger and differential feed, and it now fits me better and the knit didn’t stretch! Then I went to Joanns’ to get those patterns, then went to Linens N’ Things to get a few things for the shower I’m doing the bridesmaid thing for tomorrow (needed something I could put cheese & crackers on– hopefully I can find a use for it afterwards, because it’s definitely reusable). 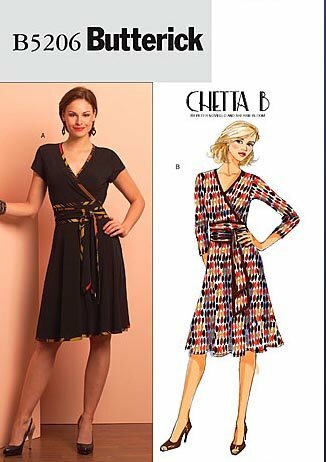 And then went back to Joann’s and bought some fabric, because I’d seen some that I was eyeing that would work nicely for one of the patterns I just bought (the shorter version of McCalls’ 5624. Going to try it out with this and see how the dress looks before I try to make a long version.) I think my family’s cat approves of my choice. I’m kicking myself a little, though– these two pieces of fabric were on sale, but since there’s white involved in the print I decided to go ahead and line the dress, just for some extra security. The lining I’d originally picked didn’t have enough on the bolt, so I went back and grabbed another– I could have gotten the $3.99 a yard stuff, but it just felt stiff and I figured it would be right against my skin since it’s a summer dress, so I had to go for the $8.99 a yard stuff instead. As a result, the lining was actually more expensive than the print fabric. And I didn’t have a coupon because I misplaced my circular and could not find it after two days of searching. Oh well… I’ll just keep telling myself that the higher price means the lining is higher quality and will therefore make the dress better. 2. 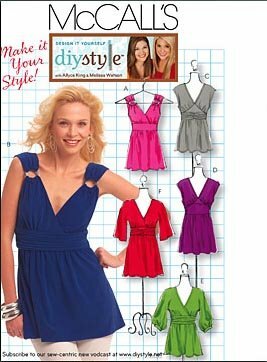 The Sewing Divas also had a tutorial for drafting a reverse scarf sleeve. Nice way to change up a tried-and-true pattern a bit. 3. Fun new blog of the week: Craft Tutorials. I haven’t had a chance to dig through the archives much yet, but this miniature dry-erase board made from a recycled envelope looks like fun…. 4. 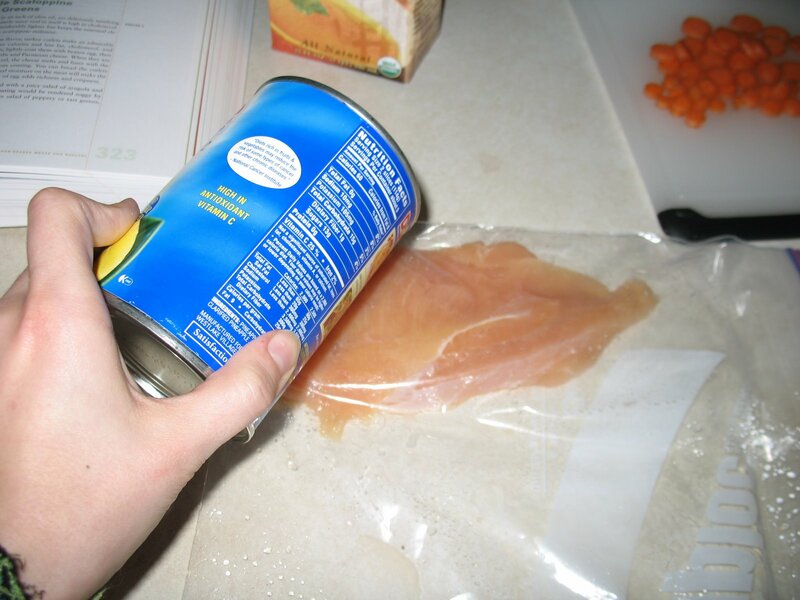 Another fun blog, which I found through a spontaneous stop over at ReadyMade: Ikea Hacker. Basically like Wardrobe Refashion, but for cheap Ikea housewares. I have a feeling this site would be much more dangerous if I had a place of my own to decorate. And an Ikea that’s closer than an hour or so away. The project that started this whole runaway train of thought: the Rome project. When I was in 8th grade, we were doing a unit on ancient Rome in my history class, and each student got assigned a different aspect of life in Rome to research. We were supposed to give an oral report and, I can’t remember if it was required or just one of the options, a visual aid. I got assigned weapons and armor. Which I’d thought was pretty lame, at first… I was a good bit girlier back then than I am now, and with the way my movie/literature interests have evolved, I’d probably think that was a pretty sweet assignment now. But I was pretty excited about the project by the end, mostly due to my visual aid: I bought a Ken doll (the only one I ever owned, for the record) and turned him into a Roman centurion. Made a little red tunic for him, and then I made the plate armor out of strips of cardboard covered with aluminum foil. That part looked pretty good. I also remember painting the gladiator lace-up sandals directly onto his legs. The part I had the most trouble with was his helmet– I ended up making it out of polymer clay (the paintable kind, because this was just when it was starting to come out as a craft supply), and it was way too big because I couldn’t bake it directly onto his head. I think I may have made the sword out of clay too. The clay parts of the outfit didn’t survive long past the due date, but I really did think that armor was pretty good. This may have also been an 8th grade project–I had the same teacher for 11th grade chemistry, but I’m pretty sure this was the junior high class because I had two lab partners in chem and only one partner for this particular project. The chemistry teacher at my school (private school, and 7th-12th were in the same building, so we had a lot of overlapping teachers between junior and high school) was rather quirky, and we were doing a basic chemistry unit. Our last assignment before Christmas break was to pair up and make her a chemistry-related Christmas T-shirt. So my best friend and I teamed up to make her a snowflake shirt, based on hexagon-shaped chemical formulas. Typical early 90s job in glittery puffy paint, but I still think we had one of the best shirts in the class. Of course, I have no idea how those snowflakes would have reacted to each other had they really been together in a test tube…for all I know, we created a formula to make a minor explosion. Now this one I do actually still have, though it’s buried in my bedroom at the moment. For one of my (I’m pretty sure it’s history) classes, we had to do a geneaology project about our families, back to our great-grandparents, and include pictures and such. 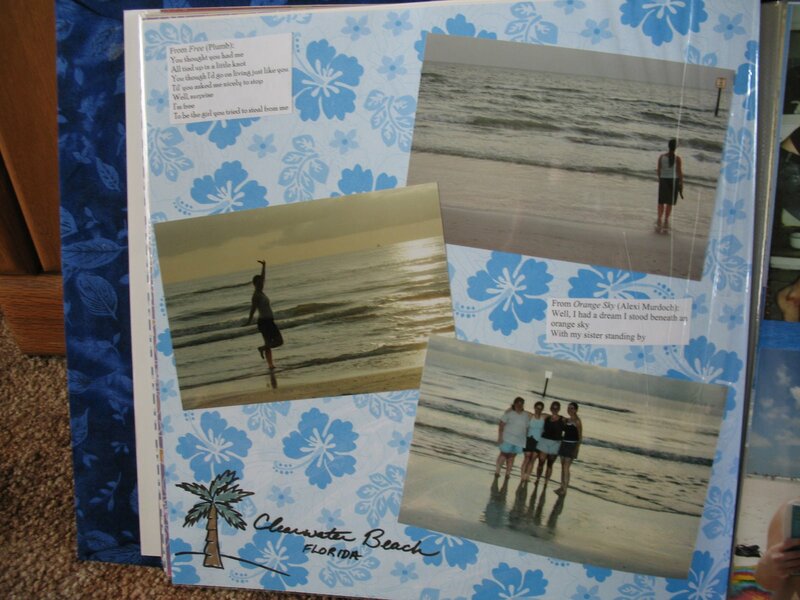 I made mine kind of scrapbook-style (I think this was when I was first starting to get into it, thanks to a scrapbooking kit that one of my crafty aunts gave me for Christmas one year. At any rate, I did have the deckle scissors, and I know I didn’t have those until I started doing that. )–had some really flimsy paper that may or may not have been sheets of newsprint, but at any rate it looked old. And so I printed everything onto that, glued my photocopies of the pictures on the same stuff, and did a little bookbinding project (the only one I ever did that turned out– good thing, since I was getting graded!) with mat board covered with black construction paper and a dark mulberry paper that I drew the title on with a gold pen. It was very typically heritage-looking. Fitting for the subject, but I don’t think I’m ever going to do one that style again. I like brighter colors. Anyway, as I said, I do still have that one. I guess I figured it might be good to pass along to my non-existent kids someday. But I can at least take a picture to post on here sometime. One of my favorites was actually for an English class–sophomore year American Lit. We were studying John Steinbeck, and were supposed to do some kind of dramatic summary in groups. I was fortunate to get into a rather creative group (the groups were divided based on who picked what book, and ours was The Moon Is Down, which is the only Steinbeck book I’ve ever read and actually liked.) So we decided that for our presentation, rather than act it out ourselves, we would do a puppet show. So we spent a couple long afternoons making heads out of paper mache and yarn, my mom was kind enough to help us with the “costumes” since we were on a time crunch, and my one friend rigged up some kind of stage that we could hang across the classroom doorway while we were in the hall. Our theme music was the Imperial March from Star Wars. We made scrolling (sort of) credits to go on top of them. And little sticks of felt dynamite hanging from parachutes, which we tied to miniature Hershey’s bars and threw at our classmates during the show (in the book, the people resisting the Nazis air-dropped dynamite tied to chocolate bars so that kids would pick them up and bring them home to their parents). Needless to say, that made our presentation the most popular. 😉 I really wish I could see the video of that again… one of my friends in the group videotaped it, and I saw it at her house once during a sleepover, but this was before digital videocameras and it was some kind of format that couldn’t be copied onto VHS with what they had or something. Oh well. Another science-class project, and the only thing I liked about freshman year physical science…we had a “design your own experiment” project that we had to do, and my best friend and I decided that for our scientific experiment, we were going to make cookies and see what effects certain compounds common in baking (i.e. salt, baking powder–see, this is chemistry!) had on the finished products. (I know there was a third ingredient involved, but I can’t remember what.) So we made four batches of chocolate chip cookies–a “control” group made normally, and then leaving one of the three test ingredients out of each of the other three batches. And then we ate them and recorded the taste-test results. Note to self: Never leave the baking powder/soda out of your cookies again. It was kind of fun to think back on those, actually. 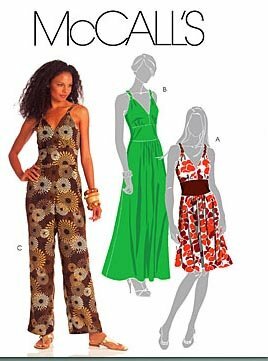 I may have to do another nostalgia post about those teenage clothes sewing projects that I also wish I had pictures of, if only for me to laugh at. Spent the afternoon with my mom, watching the Sci-fi channel’s Eureka marathon and sewing. A fitting activity, since Mom is the one who taught me how to sew. I made BurdaStyle’s apron pattern and started on the matching oven mitts for J’s wedding present. The apron sewed up really fast, though I did have to adjust the neck strap. And I got one of the four pieces for the mitts quilted. 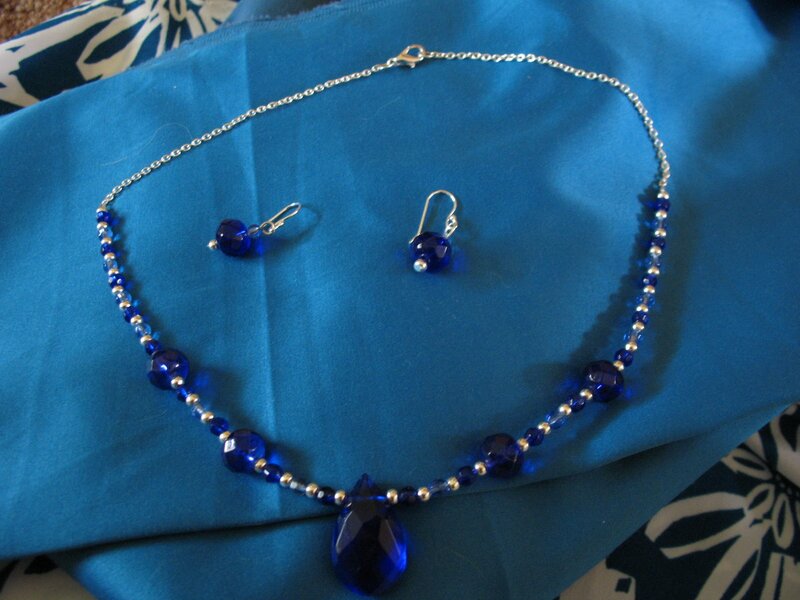 No pics yet– I want to wait until I have the set done. 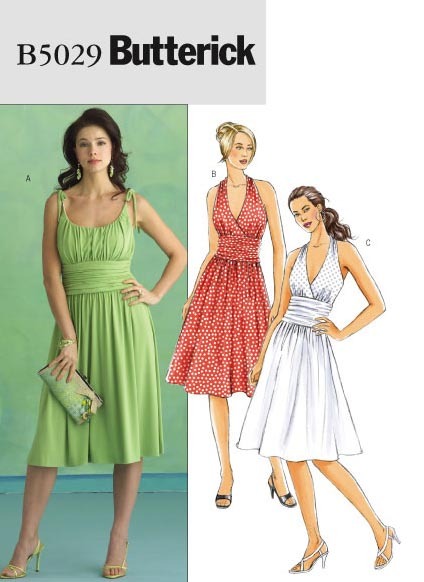 Mom was also kind enough to help me look over some patterns that I’m thinking about buying– Joann’s is having a sale this coming weekend on Butterick and McCall’s patterns, and for some reason, I’m in the mood to make some dresses to just wear on an everyday basis during the summer. A bit odd, I guess, but I do like wearing skirts in the summer, so maybe it’s not that much of a stretch. Anyway, these are the patterns I think I’ve settled on. I’m still debating about this last one. Oh yeah… I just realized this is my 200th post!